Samantha In Her Flying Suit. Samantha wore her "flying suit" in 21 episodes but there were actually 10 different dresses used. This witch's suit was only worn for the Christmas episode "Humbug Not To Be Spoken Here.". 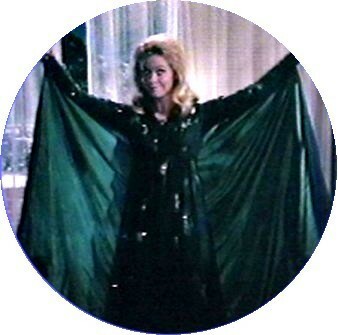 Wallpaper and background images in the Bewitched club tagged: bewitched elizabeth montgomery samantha's flying suits witch photo. This Bewitched photo contains mantel. There might also be opera mantel, opera kap, capote, hooded cloak, bonte mantel, and surcoat. This is a fabulous photo Cammie the flying suit is very realistic. Have A Bewitched Thanksgiving dag From Endora!